Chris is the Chief Executive Officer of Opteon, a role he has held since July 2016. Chris has been with Opteon since 2006, and, prior to Opteon’s integration, was previously CEO of the largest member firm. 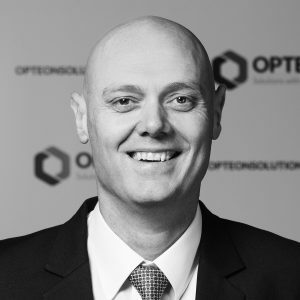 During his time as CEO, Chris has led the Opteon team in successfully transitioning to a new business model, including the acquisition of 17-member firms resulting in the integration of 90% of the total revenue into a wholly owned company, along with 3 other acquisitions throughout Australia and New Zealand. He is currently executing an ambitious business plan for Opteon designed to deliver further growth through organic means, strategic acquisitions into other non-property sectors, and international expansion. Chris is focused on consolidating Opteon’s position as a technology leader through innovation, particularly in the areas of property technology, professional services software solutions and diversifying business and product lines. Chris has qualifications in Accounting, Real Estate, Valuations, a Master of Business (Property) and Master of Business Administration (MBA). He is a Certified Practicing Valuer with the Australian Property Institute (API), a member of the Royal Institution of Chartered Surveyors (RICS) and more recently an API Board Director since May 2018.